If you want to express your happiness on your wedding day in a unique, yet in an age old tradition, you should look at this striking cake topper. 6" tall x 41/4" wide. 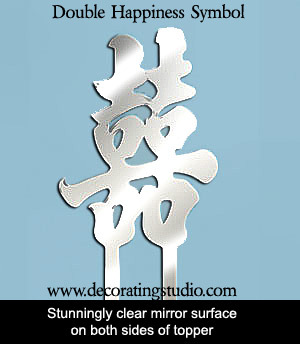 This cake topper symbol stands for "Double Happiness" and is just as beautiful on the front as the back since both sides are clear mirror surfaces. This beautiful piece is laser cut from double sided acrylic mirror (clear and sharp reflections). Your cake topper arrives with protective film on both sides (just peel off when you receive your cake topper) to prevent any scratching or abrasions on the mirror surface. Clean with clear soapy water and dry with a soft cloth and use this cake topper on your wedding cake and all of your anniversary cakes to come. Cake jewelry is non-returnable.